A NASA space telescope designed to hunt for black holes and other mysteries of the universe passed a key test in orbit last week, setting the stage for the X-ray observatory to begin its prime science-gathering mission, NASA says. NASA's Nuclear Spectroscopic Telescope Array, or NuSTAR for short, passed a post-launch review of its hardware, instruments and calibration in orbit last week. The observatory will begin gathering science data for its main science operations phase in August, NASA officials said in a statement. 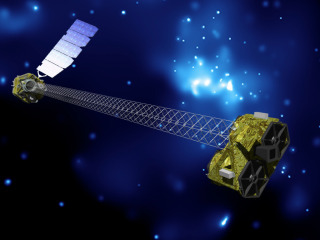 NuSTAR is designed to observe high-energy, short-wavelength X-ray light from some of the most dynamic objects in space, including black holes and supernova remnants. The observatory was launched into space June 13 from near the Kwajalein Atoll in the South Pacific. Roughly a week later, NuSTAR stretched out its massive 33-foot (10-meter) mast, which separates its two X-ray light-gathering optics from a point where the light will be focused and collected by a camera. On June 28, NuSTAR took its first photos of a nearby black hole that is consuming a neighboring giant star. The galactic black hole, called Cygnus X-1, is well-studied, and is extremely bright in X-rays. To assess the health of the spacecraft's instruments, NuSTAR has been observing bright X-ray sources across the sky, NASA officials said. Last week, the observatory participated in an international project that brought NuSTAR together with NASA's Chandra X-ray Observatory and Swift telescope, the European Space Agency's International Gamma-Ray Astrophysics Laboratory (INTEGRAL) and XMM-Newton satellites, and the Japan Aerospace Exploration Agency's Suzaku satellite. The observatories teamed up to simultaneously observe the quasar 3C 273, which is an extremely bright, high-energy object located about 2.4 billion light-years away, NASA officials said. Quasars are the most luminous, powerful and energetic objects in the universe. They are powered by massive black holes that gobble surrounding gas and dust and spew out huge amounts of energy. The quasar 3C 273 is the first quasar to be identified and is optically the brightest quasar in the sky. By coordinating efforts between the six space observatories, scientists from the various missions were able to accurately measure the sensitivities of their instruments relative to one other. The observations also produced joint sets of data for science investigations, according to NASA officials. From July 21 to 24, NuSTAR also studied the supermassive black hole at the center of our own Milky Way galaxy as part of a large, multi-wavelength campaign. This black hole, called Sagittarius A* (pronounced "Sagittarius A-Star"), weighs approximately 4 million times as much as the sun, NASA officials said. NuSTAR's observations of Sagittarius A* were compared to coordinated infrared images from the Keck telescopes in Hawaii, low-energy X-ray data from Chandra, and very high-energy gamma-ray data from the High Energy Stereoscopic System (HESS) in Namibia. The instruments monitored the flickering of Sagittarius A* as it accretes matter, enabling astronomers to better understand the physics of black hole growth and the extreme environments around these cosmic giants.